The River Thames has a tidal fluctuation of several meters at Kew Bridge. This photo must have been taken at low tide as the banks and starlings are quite evident. We were on a visit to the Royal Botanical Gardens, whose entrance is a few meters from the bridge. This photo (looking north) doesn't do justice to the idyllic setting of Kew Green and Kew Garden on the south bank. This is the third bridge built at this site. The first two bridges were toll crossings, built by the owner of the ferry crossing (and his son) during the 18th century but they proved to be inadequate. The third bridge was better funded (£250,000) by Middlesex and Surrey Counties. It was built of white limestone quarried from the Isle of Purbeck in Dorset County. It is a 360 m (1182 ft) viaduct that includes a three-span, closed spandrel, stone masonry arch over the River Thames. Two of the piers are in the river and support an arch span of 41 m (133 ft). The bridge was completed in 1903 to much fanfare including a visit from King Edward VII. It was declared a protected structure in 1983. 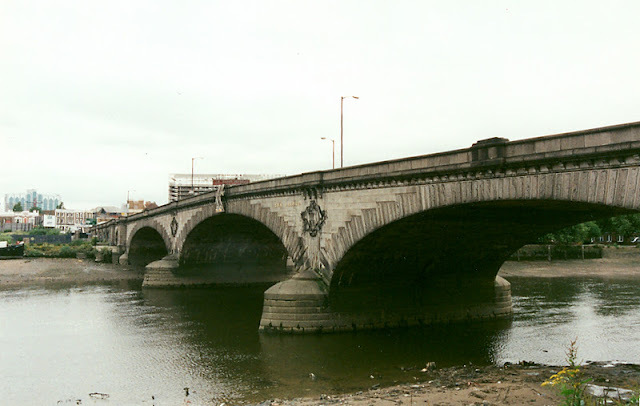 Thames River Bridges: Kew Bridge by Mark Yashinsky is licensed under a Creative Commons Attribution 3.0 United States License.